One that is most acknowledged in any marketing research study is the gap between customer’s stated attitude and their actual behavior. When the customer answers the question on paper (or screen) they are asked to answer about their expected behavior but the answer is still rooted in the attitude. For example, when you ask a customer about likelihood of purchase, paying for services or recommend the product/service to others the customer states their current attitude and not what they will do when presented with the exact situation in the real world. Two is trying to compute a net metric based on the stated attitude level. They result is data loss (because some responses are thrown away) and the need for extremely large number of samples to get statistically significant results. According to research published in Marketing Research, (Summer2007,Vol. 19 Issue 2) up to 26 times more samples are needed for net metrics. 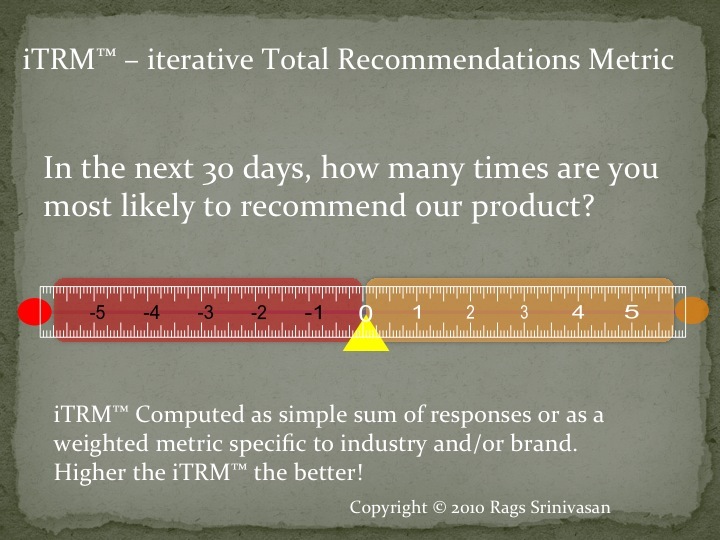 I propose here a newer and actionable metric – iTRM (iterative Total Recommendation Metric). This addresses both the shortcomings listed above. First, it gets closer to actual customer behavior when it comes to recommendations than any of the metrics. Second there is no data loss, all responses are counted. Here is how the metric is calculated. The time horizon is specific and limited, 1 month. The time limit however does not imply that the measurement must be repeated every month but if the metric is as a predictor of sales it requires monthly measurements. The customers do not have to make subjective judgments about rating scales. For example a 8 for one could be 6 for another in many ordinal scales measuring likelihoods. Here it is the exact number of actual recommendations. This is simple to administer and measure. It can be either a simple sum or can be continuously improved to be a weighted sum that is different for different industries and even for specific brands based on past data. (The word iterative stands for both my brand and the iterative process by which the metric evolves). The limit of 5 is not a shortcoming given the specific action and the time horizon. If for a particular brand we find the need for higher scale, it can easily “iteratively” improved upon and still be consistent with past results. It is easy to validate its predictability and improve on the weighted calculation. Overall, I believe iTRM provides a better measure of WoM with potential to use and easily validate as a predictor of growth. How do you measure your WoM? You are correct. With any survey the is a limit to measuring the behavior but asking people on specific behavior the metric gets closer. isn’t your metric facing the same first key shortcoming you mentioned?